Arsenal striker Alexandre Lacazette did not react well to finding out he’s slower than team-mate Pierre-Emerick Aubameyang on FIFA 19! Watch the video below as the France international throws his rating card in the bin and walks out after finding out about his pace. 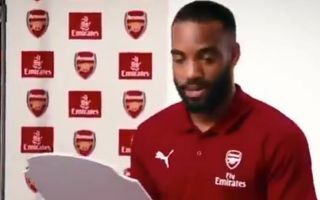 Aubameyang is known to be one of the fastest players in world football, but this clip shows Lacazette clearly thinks he’s the speedier of the two players. One thing’s for certain, the duo should be fun to play with for Arsenal fans on the latest edition of FIFA.